This Sunday, April 5, 2015, is Easter Sunday and we are offering our delicious Easter Sunday Brunch service from 10 am to 3 pm (extended 1 hour to make sure everyone gets to celebrate). 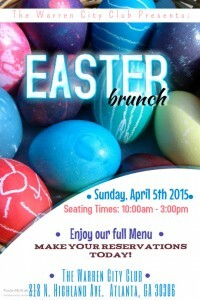 Easter Sunday is everyone’s favorite Sunday for Brunch, besides Mother’s Day (we love you Mom), so make your reservation now. Weather permitting, sit outside and enjoy spring.